Gall-inducing moths lay their eggs in the tree bark, where the larvae form the characteristic roundish swellings as they grow larger. In their turn, these galls attract various parasitoids and inquiline wasps – wasps that have lost the ability to form galls for their own eggs – and so they take advantage of the galls of other species, while under development. The inquilines modify the galls into larger ones which subsequently last longer and attract even more attention. As a result, even though abundant as young, the new moth’s larvae rarely survive and their density in the field later in life is low. 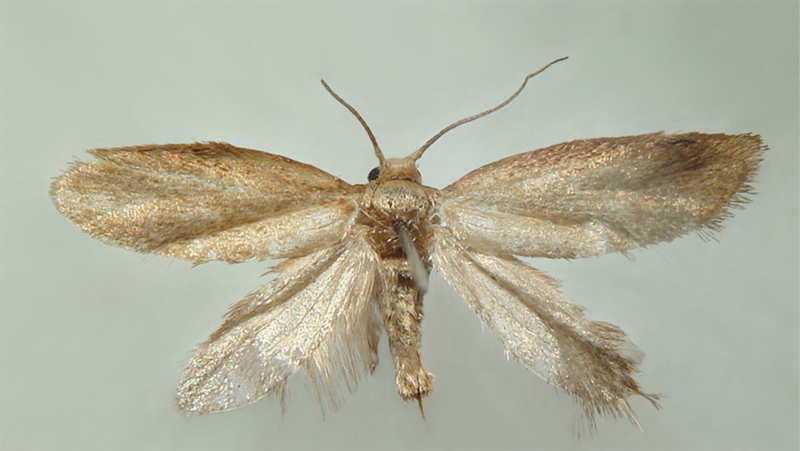 “It took several years to obtain a small number of C. pampeanus pupae and adults to use for the description,” say the authors. Open savannahs of southern Brazil, where populations of the new moth’s host plant (the Uruguayan pepper tree) are found, have been suffering from anthropic impact for decades, mostly caused by agriculture and cattle ranching. Extant populations of the new species are distant and isolated from each other, being restricted to a small geographic area in the northeast Southern Brazilian “Campos” (= Pampean savannah), a neglected biome from a nature preservation perspective. Most of the moths have retreated to higher elevations, such as hilltops and hill slopes interspersed with small bushes, where they get shelter from the anthropic influence.